The first ever Menorca Maxi got underway today with close and exciting racing. Tom Whidden, strategist on Magic Carpet3 and Dennis Conner’s tactician in six America’s Cup campaigns, described it as some of the best sailing he has ever had. 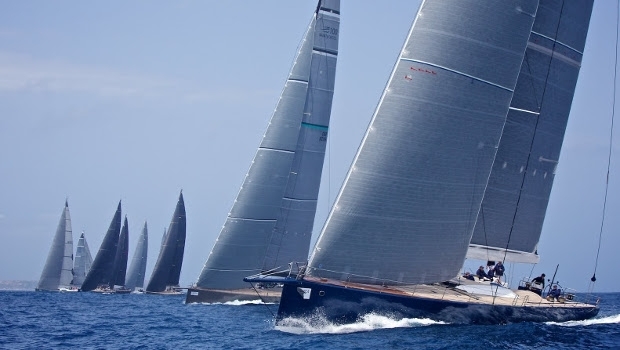 The nine Wallys and three J Class yachts sailed one race off Mahón's bay under light-to-moderate conditions, with 7 to 10 knots of breeze and a rolling swell. The right hand side of the course, closer to the shore, proved to be the clear favorite and Tango G benefited the most after a start at the committee boat end of the line. French former America's Cup skipper Marc Pajot, skipper and tactician onboard Tango G, downplayed the importance of today's victory: "It's always easier when you win. We didn't have the impression onboard that tactics were difficult today and with the exception of a small manoeuvre at the mark, everything went smooth during the race. "The right hand side of the course paid a big dividend and we were convinced about it. We were a bit surprised that we were just two boats to make that tactical decision. Our boat also has an edge in these conditions, plus crew work was good; overall it was a good day. "However, nothing is certain in the sport of sailing. Every day is different and we start tomorrow with a clean sheet. The more experience you gain, the better you understand that in this sport and in this competitive fleet, you should never take anything for granted." A fierce, interesting match-race took place at the front of the fleet as the two WallyCentos, Magic Carpet3 and Open Season fought for line honours. Magic Carpet3 got the upper hand despite blowing out her spinnaker on the first run. Tom Whidden, sailng on Magic Carpet3 commented on the battle between the two WallyCentos: "It was a great sailing today. Nobody can complain about the sailing conditions, they were just great and the race committee did a great job. "We had a nice plan and started at the front. We probably should have gone to the right. We wanted the pin end at the start and we would have liked to get across but we were never really able to cross Open Season. It was a good match-race and I like that. It makes our boat to sail better. We broke our spinnaker in the first run but we actually did a good job in rounding the bottom gate. We picked the more favored side and went to the left, that, on the second beat was better. "We had a good match-race up near the mark. We prevented them from rounding easily, so they had to tack twice and we got the lead we needed. We are fast downwind and it seems that the changes we made during the winter made us more competitive downwind. "Nevertheless, this is sailboat racing and tomorrow is another day!" There was close racing for the three J Class yachts, with place changing keeping the crews on their toes on the opening day of Menorca Maxi. Conditions for the J-Class were a challenging combination of relatively light southwesterly breeze and a rolling swell outside the harbour of Mahon. Lionheart and Ranger had a close duel on the first upwind leg, until Lionheart nosed ahead to round the first mark in the lead. “We were pretty close together over there, it was good,” added Bekking. Hanuman, which had opted for the left-hand side of the beat after returning to clear the line following an OCS, rounded in second, while Ranger went into the downwind leg in third place. However, a neat gybe-set from Ranger saw her split away from Hanuman on the downwind leg, and when the two boats gybed back together it was Ranger in second place. The places remained unchanged until the finish as Lionheart went on to take the win. Two more windward/leeward races are scheduled for Friday.